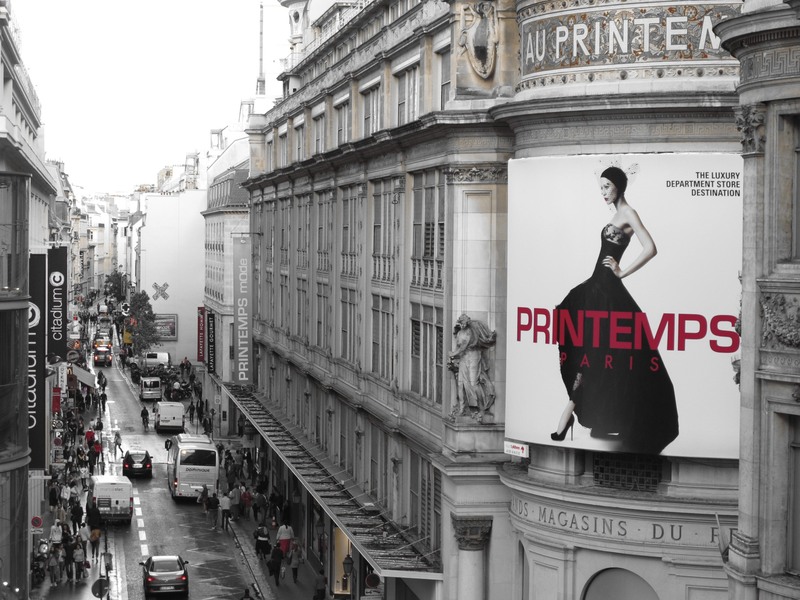 Printemps department store in Paris is filled with all types of marvelous items most of which exceeded the amount I wished to spend when I was there recently with my sister Margaret. Everything in the store has a price tag and even a trip to the loo for a bathroom break cost a euro, but there was one thing that could be had there for free. You have seen it before if you saw a post I wrote a few weeks ago. 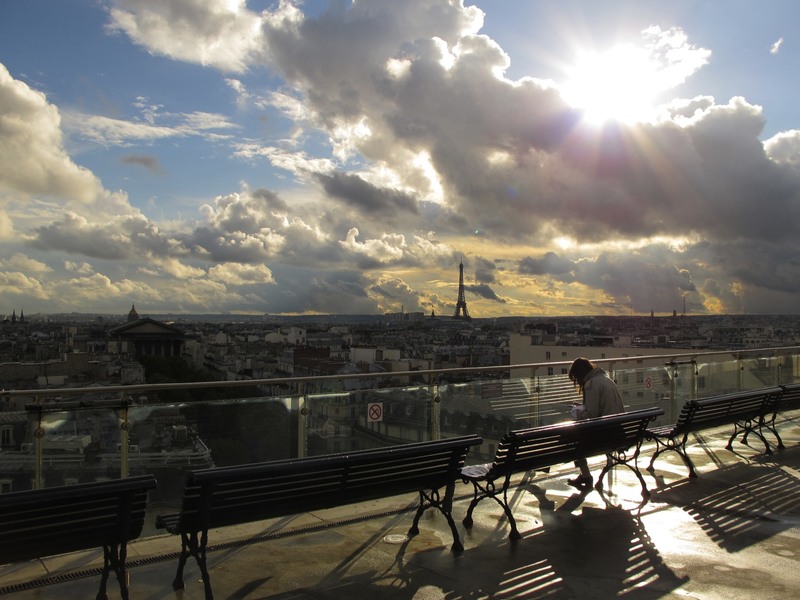 If you missed it, let me just say that what you get for free at Printemps is an amazing view of the Paris skyline. 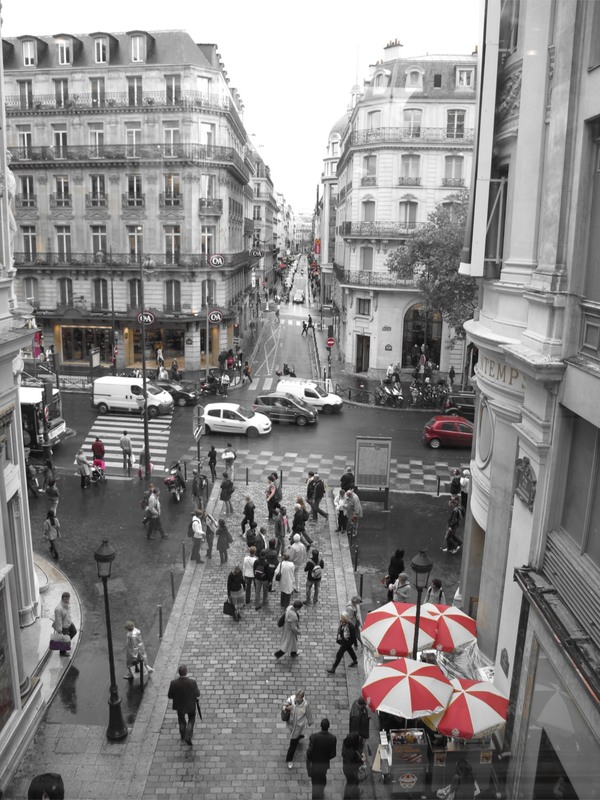 I snapped this photograph on a walkway between two of the Printemps buildings. 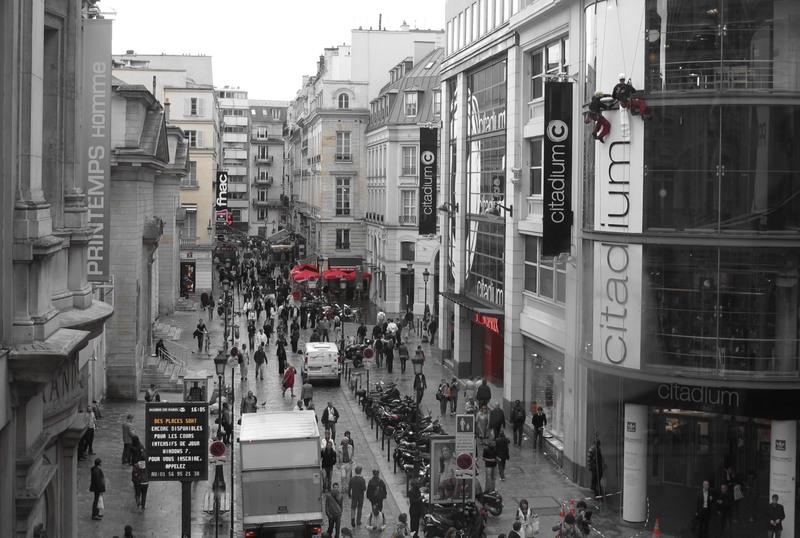 Click on it to get a clear look at the two window cleaners on the upper right side of the image. This is from the other side of the walkway. I had my Canon G11 set in Color Accent mode which in this case was set to pick up the color red. 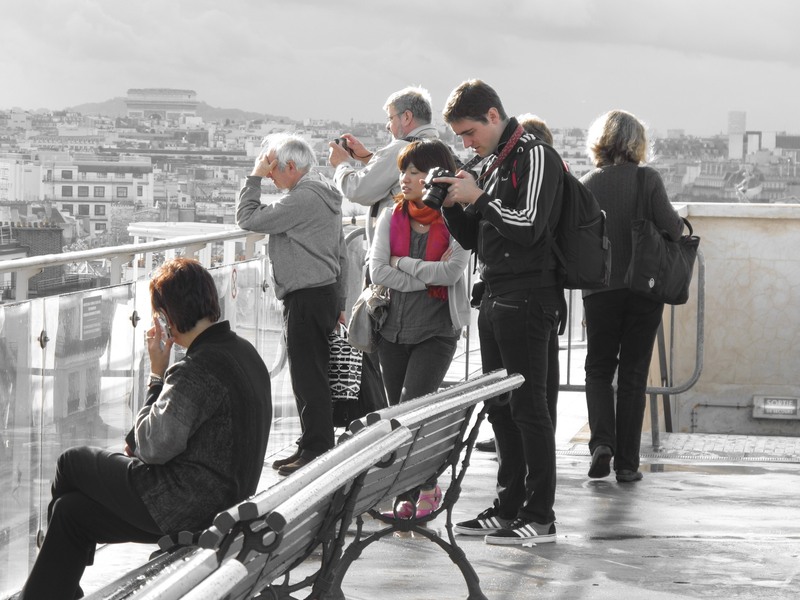 Here you can see a small gathering of people trying to catch the perfect shot from the rooftop terrace. Another image from the rooftop. I know I have completely disregarded the rule of thirds but I don’t care. I like this shot with the abundance of clouds and sky. 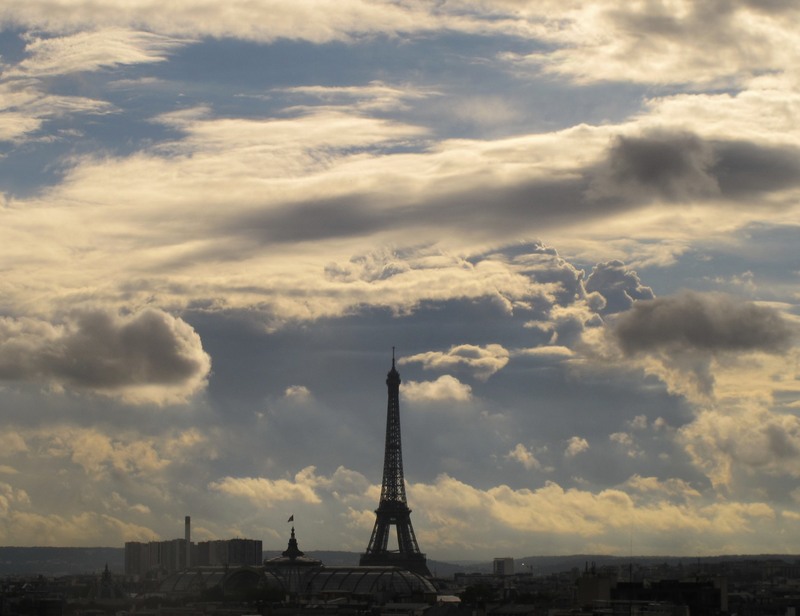 More big sky along with the ever familiar Eiffel Tower. There is ample space to have a rest from your shopping or sightseeing and there is a small restaurant on the same level serving light snacks and drinks. Anne from Anne In Oxfordshire visits friends in Paris fairly often and was curious as to where I had managed to capture images like those above. I told her when she asked in a comment that I was saving the location for another post, but now that I’ve done the big reveal I wonder if anyone worked it out before today. 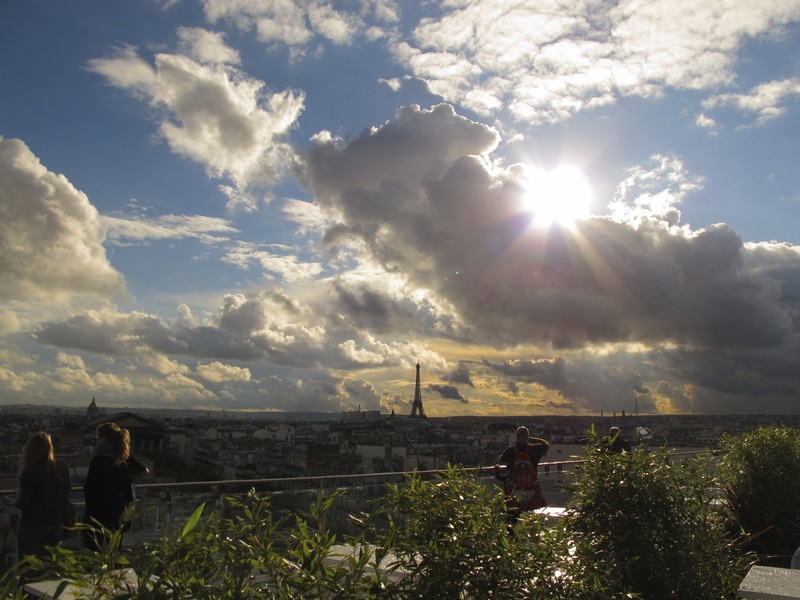 This entry was posted in Adventure, Photography, Travel and tagged Anne In Oxfordshire, Eiffel Tower, Elizabeth Harper, Gifts Of The Journey, Margaret Harper, Paris, Paris Skyline, Photography, Photography Hot Spots Paris, Printemps, Rule Of Thirds. Bookmark the permalink. Purty! I’m shopping for my first digital camera and hope to get pictures half that lovely when I travel. Thank you for the reveal Elizabeth … that is definitely on my to go to sites . .. and thank you for the link to my blog too. We must try and meet up . 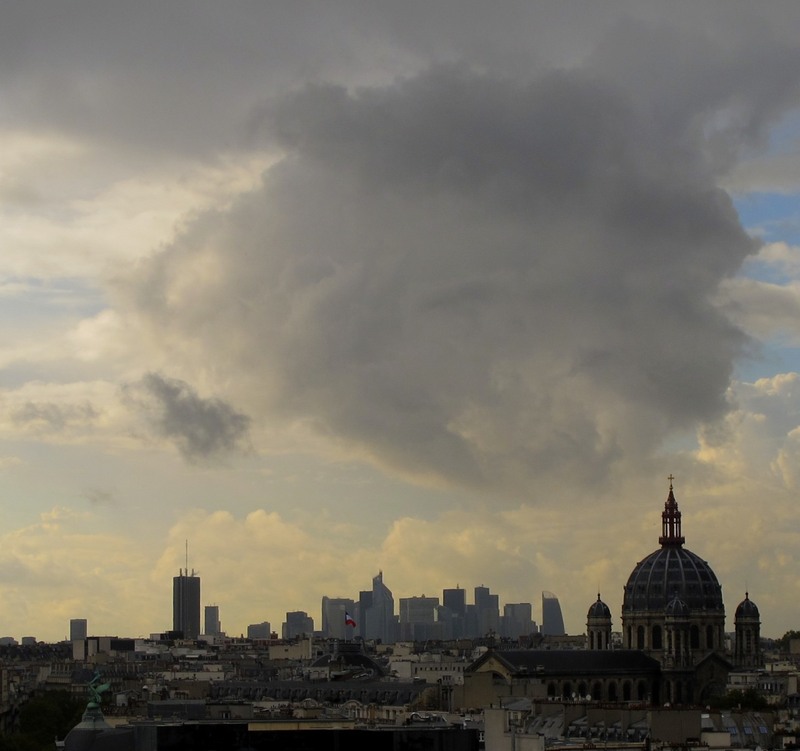 I hope you didn’t feel I was criticsising your photo from your previous Paris-and-clouds post because if you did I would feel completely mortified! Irrespective, may I say that I think these are fabulous, and the one where you have loads of skyline looks like a Dutch master. As I said before, gobsmacking. I hope you took some shots upwasd when you were in Au Printemps. at the stained glass ceiling. I remember being in that store and looking longingly at some silk carpets – waaaaay beyond my pocket then and now – and thinking, this is how the other half live. But looking at the ceiling was for free..
Suzanne ~ I’m so glad you enjoyed the photos. It’s hard to take a bad one from that position. Donna ~ What type of camera are you considering? Anne ~ It is an easy store to find with a metro line stop that lets you off right in front of it. I am sure will meet in person someday. Mariellen ~ I certainly did not find your comment critical before. Each of us has a preference when it comes to what we find visually appealing and I accepted yours without any negative feeling. No worries. I must have missed the stained glass ceiling, but I did pause long enough to look at the price tags on several items and thought about who might pay almost 300 euros for a child’s coat that they would quickly outgrow. I am all for fashion, but when I spend a lot on a coat, I tend wear it for 20 years or more. E – Check it out! Anne, worth paying a tenner for a cup of tea and cake if you get there…although I was last there 15 years ago, it might be more now. I hadn’t even tried to think where the shots were taken, but once you shared the happy spot I recognized it. 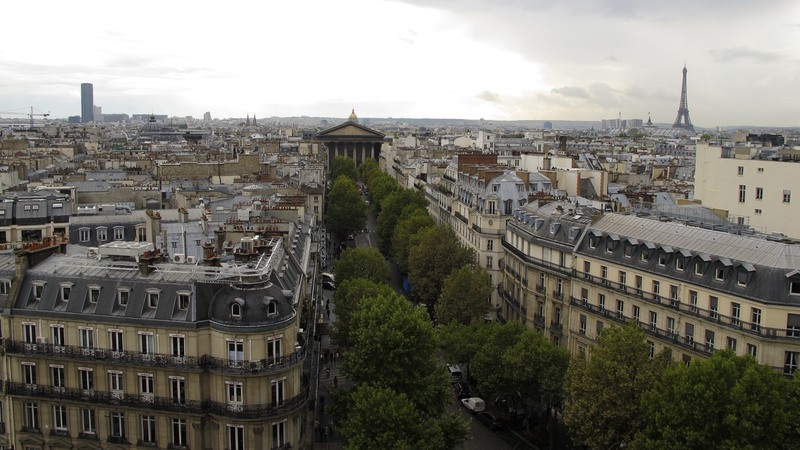 Long ago, (’93), when being a tourist in Printemps a local told us to not miss the rooftops views…we thanked her heartily for that because it provided some of my favorite shots from that time and the stain glass ceiling on the floor below was a treat too. And like Mariellen said too, we enjoyed a surprisingly affordable snack in the cafe just below….I am sure that has changed. Thanks Elizabeth for the fabulous peek. What spectacular views!! And – I love how your camera picks up and highlights only certain colors. Very cool!!! Oh Wow! What fantastic views and no I didn’t guess where they were taken. I was thinking off the top of the Arch de Triumph.